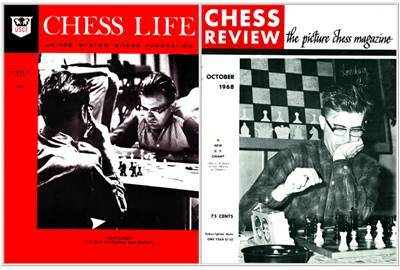 In this blog's monthly 'On the Cover' series, when was the last time the same chess personality featured on the covers of both American chess magazines 50 years ago? It turns out that it was exactly two years ago, in September 1966, when Spassky was so honored. [...] This month, 50 years ago, Larry Evans became the first person to appear solo on the cover of both magazines. To merit that honor, GM Evans had become U.S. Champion for the third time. This month's covers from 50 years ago featured the U.S. Open Champion, Bent Larsen of Denmark. The last time we saw him in this series was November 1967 'On the Cover', when Chess Review used the same photo (and as I noted, already for at least the second time). Whoever arranged the 69th Annual U.S. Open Chess Championship deserves a special medal! Snowmass-at-Aspen sounded very intriguing. The great question was ... HOW DOES ONE GET THERE? Easy, just get to Aspen and from there you take a shuttle bus. Bent Larsen took first prize and the championship trophy with great ease, scoring ten wins and only two draws (with Pal Benko and Robert Byrne). He was unruffled all the time, and only the game with James Sherwin seemed to cause him some annoyance. The Chess Review report was more straightforward. United States Open  Bent Larsen of Denmark imparted a definitely international flavor to the U.S. Open, and also won it. (Can we use him on our Olympiad team?) He was held to draws only by Pal Benko of New York and Robert Byrne of Indianapolis and thus scored 11-1. Benko, not so long ago from Hungary, and Walter Shawn Browne, who has applied for Australian citizenship, further flavored the Open internationally by tying for second and third at 9 1/2 - 2 1/2. Byrne, Larry Kaufman of Silver Spring, Maryland, and Dr. Anthony Saidy of Los Angeles tied for fourth, fifth and sixth at 9-3. Canadian Open  Larsen also scored a near sweep in the Canadian Open at Toronto. Fifteen-year-old Ken Rogoff of Rochester, New York, staged a sensation by nicking him for a draw. But Larsen went on to win (more details, next issue). CL carried another report, 'Observation Point' by Miro Radojcic, subtitled 'The Match That Never Was'. TMTNW? Exactly six years ago day for day, in Another Fictitious Match (October 2012), I posted a short series about another TMTNW, the 1975 Karpov - Fischer title match: 1975 Fischer forfeits to Karpov. In October 1968, Radojcic would not have been discussing that 1975 match. He was talking about 1968 Spassky - Larsen, played in May 1968 at Malmo, Sweden, one of the semifinal matches in the series of 1967-69 Candidates Matches, eventually won by Spassky. TMTNW here meant Larsen starting the match with three straight losses to Spassky. Larsen was not a match player, he was a tournament player, and 1968 was the best tournament year of his career.